Winter Quarter, 2018 Interactive Ecology interns will participate in field work and building plant collections through seed germination, propagation, nursery work and planting. All day field trips to local wild areas will focus on plant communities and techniques involved in vegetation mapping, classification, habitat assessment and surveys. We will have discussions and pose questions about conservation and land management, ecology & evolution, and goals for the Arboretum native gardens. There will be assigned and optional readings. All participants will keep a journal. Photography, illustration, art and using gps and smart phone technology will be encouraged (e.g. ESRI Collector). Interns can help CNPS and the Garden in developing the content for specific aspects of the MCV alliance descriptions, including research of plant species for their 'Life History Traits of the Principal Species' and ‘Fire Characteristics’. Since we are beginning to develop new vegetation alliance descriptions, which we intend to serve up on this online MCV resource, student intern work can include providing background research of ‘life history traits’ and ‘fire regime’ information on specific plant taxa. The definitions for what we have included within the Life History table is found on a resource page of this MCV website -- see http://vegetation.cnps.org/appendix1, and the definitions for the Fire Regime table is found on another page – see http://vegetation.cnps.org/appendix2. The tasks could include performing research through online websites, journal articles, books, and gray literature for a select set of plant taxa. Other work that anadvanced intern could do is help us perform field data collection and/or GIS map digitizing of rare and sensitive vegetation types in project areas where we need more information to better define, describe, and map out vegetation (or plant community) types. Field data can be collected (Our standard sampling protocol is found at http://www.cnps.org/cnps/vegetation/protocol.php), entered into standard databases, and classified to help us in describing and locating vegetation alliances and associations in particular areas, so that they can be used in resource assessment and mapping projects to guide conservation and management planning. GIS maps can be created (E.g., See http://www.cnps.org/cnps/vegetation/pdf/guidelines-rare_veg_mapping.pdf) from extrapolating information from the ground-based field data and from interpreting digital aerial imagery to digitize the vegetation types (plant communities) of specific areas. Prerequisites: Outline the skills and background information necessary to participate in this internship. If you have not previously applied fill out and submit the Pre-Internship Survey. The overall mission of the California Native Plant Society is to conserve California native plants and their natural habitats, and increase understanding, appreciation, and horticultural use of native plants. The mission of the CNPS Vegetation Program is to develop and disseminate quantifiable definitions of all types of vegetation in California. These definitions will be used to promote science-based conservation at the natural community and ecosystem level throughout the State. We have developed a new online tool with our Manual of California Vegetation (MCV) project (see http://vegetation.cnps.org/). 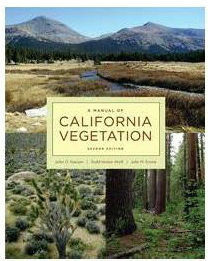 This is a research compendium for statewide classification and mapping of vegetation in California, developed over numerous years (see a general summary about the Manual at http://www.cnps.org/cnps/vegetation/manual_2ed.php). Within individual Alliance descriptions within this MCV are a variety of sections on life history strategies, quantitatively-based rules to distinguish between alliance types, remarks on plant taxonomy, fire characteristics and other natural processes that shape the ecology of each type, and regional distribution information. Some of the information compiled for these descriptions has come from ground-based vegetation surveys and some from synthesizing existing literature and data. Download pdf version of internship description. Governor Brown Issues Proclamation Declaring May 22, 2018 as "International Day for Biological Diversity". This is the first tangible evidence of a series of meetings and efforts many members of the plant conservation community had with the Governor’s Office beginning in February 2018. "Cross-lineage hybridization in the genus Arctostaphylos (Ericaceae)", by Eric Van Dyke, Reed College Bio 332 (May 2017). Effective Wild Life Corridor: Keeps deer out, but lets other creatures in. California Chapparal Institute. The best source of accurate information about native shrub land communities and California's most extensive ecosystem. Educational Opportunities at Siskiyou Field Institute. A great connection to the Klamath-Siskiyou ecoregion. Friends of the Chico State Herbarium. Upcoming Workshop on April 29: "Plant Collecting and Making Herbarium Specimens". Register for workshop. The Jepson Herbarium, University of California, Berkeley. Recent News from the Jepson Herbarium: Revision 4 of the Jepson eFlora is now online. Videos from the 2017 Northern California Botanists Symposium, 9-10 January. "DIVERSE ENVIRONMENTS: HOW PLANTS SUCCEED IN NORTHERN CALIFORNIA." Stephen Rosenthal, Santa Clara Chapter, CNPS Past President, was the videographer. Symposium was sponsored by Northern California Botanists. 1. Carex xerophila – a new sedge hiding in the chaparral. 2. New bryophyte discoveries in California: The frontier remains. 3. Cryptic host-specific diversity in the newly resurrected parasitic genus Aphyllon. 4. Chaparral seed banks: Not just for plants anymore. 5. Soil seed banks of native and exotic forbs in restored and reference northern coastal prairies. 6. Response of soil seed banks to drought in California annual grasslands. 7. Soil seed banks of a federally listed Threatened annual plant, Camissonia benitensis. 8. Collaboration and adaptive management precludes federal listing of Tahoe yellow cress. 9. A place for plants in FERC licensed hydropower projects. 10. Year of the Monkey: A rare “super bloom” for Carson Valley Monkeyflower. 11.To create a botanic garden. 12. Biogeographical wanderings in the Streptanthus howellii Alliance. 13. Pinus ponderosa: A checkered past obscured four species. 14. In search of alpine rarity: A “Rare Plant Treasure Hunt” in Yosemite National Park. 15. Fear and loathing in the Sierra Nevada: Confronting a wicked problem. 16. Pines and pine bark beetles in California: A legacy of diversity and damage. 17. Gallwasps on California Oaks. 19. Influence of coastal fog on endemism on the Central Coast of California. 20. Lichens in the mist: Investigating California’s fog lichens. 21. Impact of historic drought on the population dynamics of a fog-influenced coastal forest. 22. Varied species responses to fog in the coast redwood ecosystem. 23. Influence of Summer Fog on Patterns of Plant Diversity. 24. Jepson Prairie Preserve: 35 years of conservation, research, and public education. 25. The spicebush and the wasp. 26. Calflora, a tool for botanists and plant enthusiasts. 27. Carbonate substrates: Plant associations and climate impacts. 29. Some questions we need answered about California plants and climate change. "Pinus ponderosa: A checkered past obscured four species." By Ann Willyard, et.al. American Journal of Botany, 104(1):1-21, 2017. Recent genetic studies separate out local Santa Cruz Ponderosa Pines, like those in the Arboretum, as Pinus benthemaniana. "Fostered by Fog", a recent article in UCSC's online journal Science Notes, uses the example of 'maritime chaparral' to explore the collaboration among the Arboretum's Native Plant Program, UCSC and the California Native Plant Society in preserving threatened native California plants. The article is written by Amy McDermott and beautifully illustrated by Yvonne Byers. Brett Hall wanted to note the recent passing of a friend and colleague, Bob Haller. His work on Pinus ponderosa var. pacifica (one of the Arboretum’s mascot species for the NPP) is one small side bit of relevance to us. "John Robert (Bob) Haller, (was a) renowned California Botanist, inspirational teacher, and mentor to so many of us. Bob was international recognized for his work on pines but may be most remembered for the way he joyfully shared his love of the natural world with the rest of us - inspiring generations of botanists and avid naturalists." Read more. Read "Traversing Swanton," an essay on Scotts Creek Watershed (PDF) by James A. West. Revised 2-22-16 or visit a website derived from James West's essay (above) describing the Scotts Creek watershed area. Read Research Topics for the Scott Creek Watershed and Environs (PDF) by James A. West. Edited by Dylan Neubauer, December 2015. A Key to the Willows of Santa Cruz County (PDF) by members of the California Native Plant Society and edited by Randy Morgan. 'Ecosystems of California' documents one of Earth's most biodiverse places', with contributions from 19 authors with ties to UC Santa Cruz. Sentinel article by Stephen McCabe on how 'Live-forevers don't always, unfortunately'.